Nokia N8 now shipping with Symbian Belle? Retro-ironic Nokia fans in the market for a new phone will be interested to hear that the Nokia N8 is now shipping with Symbian Belle pre-installed - in some countries, at least. That's according to a tweet in response to a customer in India, in which the official Nokia account said, "We are already shipping new versions [of the N8] with Nokia Belle installed. Check with your local store for more information." We're waiting for Nokia to get back to us on the availability of Belle'd up N8s in the UK. Update: Nokia's PR team tells us, "Nokia N8s ship at present with Symbian Anna, this will change to Symbian Belle once the update is available." As well as the N8, some Nokia C6-01s and Nokia C7s apparently now have the updated OS out of the box, although a company representative recommends checking with your retailer to be sure. And just what delights will Symbian Belle bring to your new old handset? Six home screens (as opposed to three), visual multi-tasking, some new apps like Sharepoint and OneNote, and NFC capability. 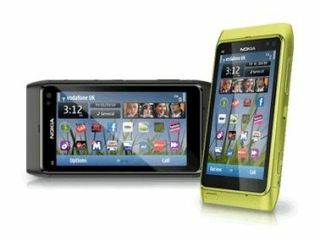 The software update will be coming to older handsets starting next month, with Belle making its way to the Nokia N8, E7, E6, X7, C6-01, C7, 500 and Nokia Oro. Sadly there's not much more information on the schedule for the roll-out, so stay tuned for more on that. But now that Nokia's all tucked up in bed with Microsoft, its focus is very much on Windows Phone handsets like the Nokia Lumia 900 which is heading UK-wards in June.